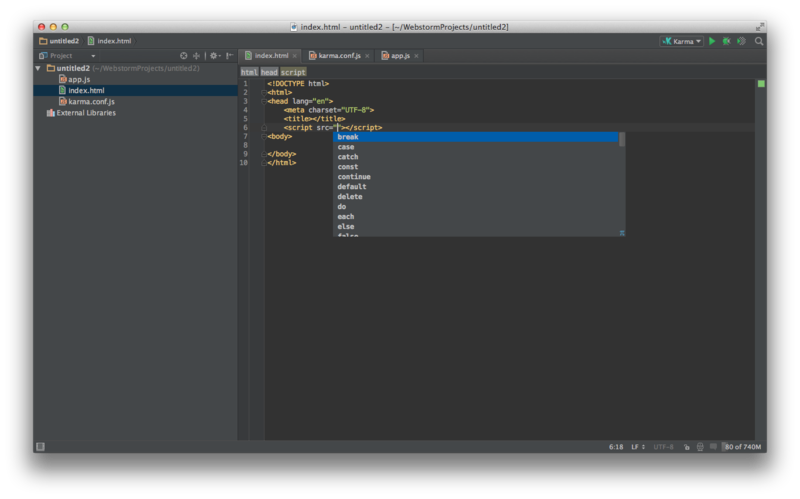 I'm trying out WebStorm and am trying to autocomplete a filename within a html page. I've typed <script src="jqu"> and am trying to get it to autocomplete the "jqu" that I've types into to the path of the jQuery.js file I've got in my project. I can't seem to get filename completion to work however. I'm prtessing Ctrl+Space to attempt to auto complete, but it's not working. Have I got the wrong key combination or can WebStorm not autocomplete file names? 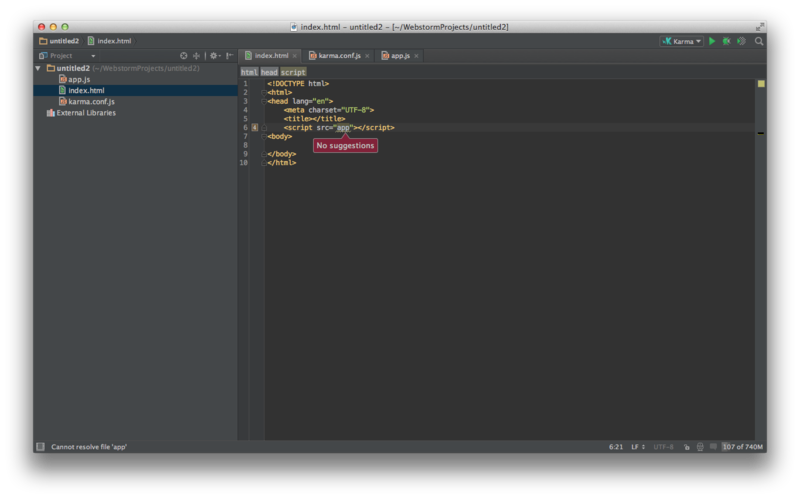 I'm using WebStorm 8.0.3 on a Mac. I've just tried this on Windows and it works perfectly, so it looks like this is a bug with the Mac version of WebStorm. Does completion work if you type exact file name (matching case)? May be, the problem is the case sensitivity? Also, type 'src=""' and hit Cmd+space within "" - does completion suggest existing files/folders? No, unfortunately filename completion doesn't work at all on the Mac, but doing the exact same thing does work on Windows. When I press Cmd+Space within the "" I get a popup displaying "No suggestions". This seems to be Mac specific. Please can you attach your idea.log and a screenshot that shows up the issue? Attached are a screen dump and the idea.log file. Please can you hit cmd+space without entering any value, just type src="" and invoke completion? Also, I can see that 'app' is highlighted - what error/warning is shown? The screenshot below is when I press Cmd+Space with nothing specified between the "". For some reason I had a language injection set for the src attribute. I've removed that and it all works fine now.